Alphacool’s new quick connectors, called the “Eiszapfen” (icicle), are the newest addition to the “Eis” series. High quality and impressive features take every water cooling system a step forward in quality and practicality! 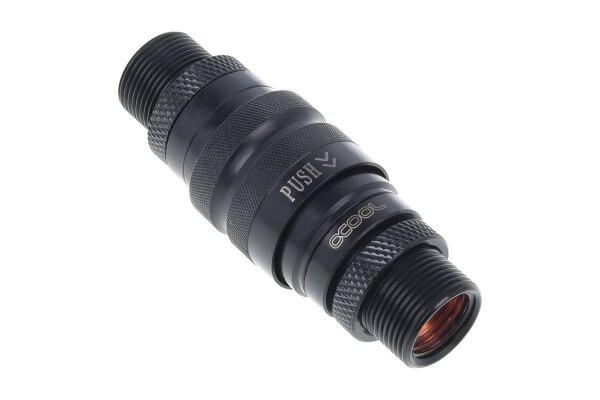 A quick-release connector can be used anywhere where expandability, flexibility, or cleanliness play a big role. The compact connectors have a 1/4” thread on both sides, making them compatible with all standard components. The connectors can be separated by pulling down the outer rings. Both sides immediately shut completely, so that no water can leak out. The special N.D.S.L. technology (no drip, no splash, no leak) ensures no water drips, splashes or leaks out while opening the connectors. When the pieces are reconnected, both sides audibly click together and are locked tightly with a double o-ring, which is simply pressed together when reconnecting. This also prevents any deterioration of the o-ring. The mechanism was also designed for longevity, to ensure a secure connections even after several years. Many quick connectors tend to compromise the flow rate. But Alphacool has found a way to solve this problem. These quick connectors can still sustain a high flow rate! Alphacool’s quick connectors are available in two models. In deep black and completely chromatized versions, they fit seamlessly into any system. The quick connectors should not be used dry for prolonged periods, as this will put stress on the o-rings and leak tightness can no longer be guaranteed. No, it is not compatible. You need the article 1010394 or 1012453. Ist diese kupplung für schläuche oder pvc rohre zu gebrauchen? Ich würde diese Kupplungen eher für Schläuche benutzen. Starre Rohre geben nicht genug nach um sie vernünftig Treppen zu können ohne etwas zu Beschädigen.